After arriving in Venice, Ethan and Ella embark on a high-speed gondola chase in the second book of this chapter book series about mystery, travel, and adventure. When Ethan and Ella first land in Venice, they are in awe of all the canals and tiny little streets. They're especially excited to look for a five-hundred-year-old-mosaic near Calle Farnese that Grandpa Harry tells them about. While the twins are out getting gelato later that day, they notice someone looking around suspiciously as he unties a gondola from a dock. The next morning, the twins hear two gondoliers arguing, one of them accusing the other of stealing his most beautiful boat. The gondolier begs Ethan and Ella to help him find the boat. They agree, and also tell the man they need to get to Calle Farnese. 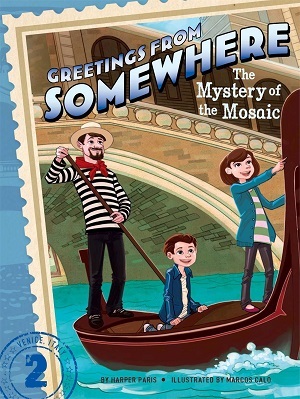 Will the twins be able to find the stolen gondola and their Grandpa's favorite mosaic...before dinner?